The client had seen an image in a magazine that he cut out and presented to us. The specification was, “I want that, please”! We replicated the design in every way possible. The installation has a large expanse of paving leading from the house to the pool. 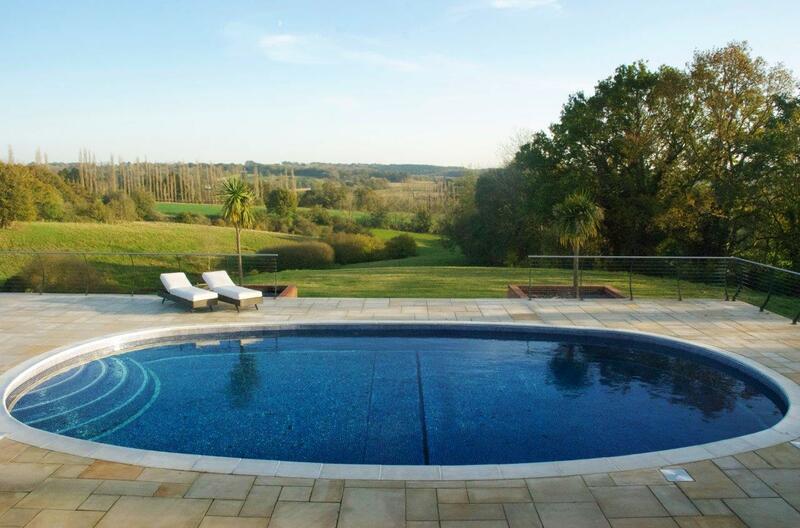 It is positioned overlooking stunning views of the surrounding countryside, and large stone steps set behind the pool lead down to the lower garden. The pool itself is an elliptical shape with a high-tech slatted solar cover system, large entry and exit steps within the pool and eight colour-change LED lights. The pool has a constant depth to allow for playing Frisbee and other pool games, along with an underfloor filtration system and heat pump, and unique underground changing rooms. This was a complex build due to the fact we initially needed to construct a rectangular concrete box in the ground; the entire pool and its surround is actually above ground level. All of the paving is on block and beam, which creates huge room space below. This enabled us to house the pump and filtration system below ground, as well as accommodating a changing area. As a result the visible pool and surrounding area is clean and uncluttered.